36 SMT Magazine • July 2017 They stated, "Circuit board manufac- turers are extremely hesitant at provid- ing instructions on drying their circuit boards. Information from the ZVEI 2 should also be regarded critically. The cardinal problem is the high tempera- ture which is recommended for temper- ing. If this is applied, the result is often de-lamination and distortion of the cir- cuit boards. Corrosion and the forma- tion of intermetallic phases of the me- tallic surfaces are also to be expected." Their research investigated "wheth- er gentle drying at 45°C or 60°C and at low relative humidity achieves the same result as tempering at high tem- peratures." They began first with QFP compo- nents, which were saturated and then dried in seven different environments, referencing J-STD-033 standards in their report. They then selected four PCB types and repeated the same procedures of satura- tion then drying and weighing to 0.1% water weight. This was done using 60°C at <1%, 45°C at <1%, and 125°C at 5%. Their summary re- sults were that "125°C demonstrates the short- est drying time, however, oxidation of the sol- dering pads and board warpage make it unsuit- able for the particular board types tested." Conclusion Their research was conducted just prior to the publication of IPC 1601, which now pro- vides detailed guidelines for the packaging and storage of PCBs, both from the PCB manufac- turer and at the assembler's manufacturing floor. It also describes the solderabilty risks asso- ciated with high temperature baking. Ultra-low RH and low temperatures can significantly miti- gate those risks while preventing moisture dam- age during reflow. SMT References 1. G. Schubert, Th. 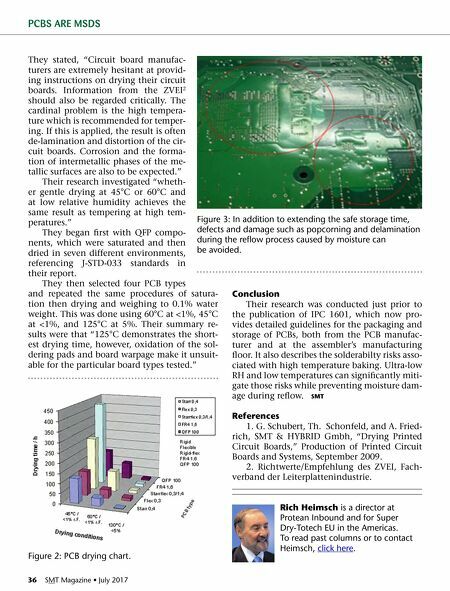 Schonfeld, and A. Fried- rich, SMT & HYBRID Gmbh, "Drying Printed Circuit Boards," Production of Printed Circuit Boards and Systems, September 2009. 2. Richtwerte/Empfehlung des ZVEI, Fach- verband der Leiterplattenindustrie. Rich Heimsch is a director at Protean Inbound and for Super Dry-Totech EU in the Americas. 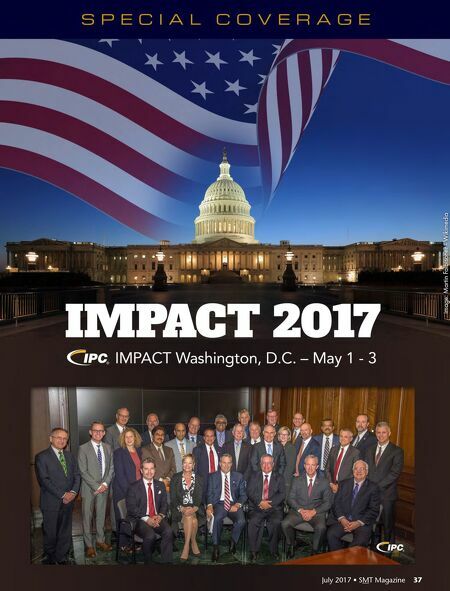 To read past columns or to contact Heimsch, click here. PCBS ARE MSDS Figure 2: PCB drying chart. Figure 3: In addition to extending the safe storage time, defects and damage such as popcorning and delamination during the reflow process caused by moisture can be avoided.